Let's get some more of that tasty plot you're hinting at! It is with some confusion and no small amount of embarrassment that I look back upon a life of comic-book reading and realise that, apart from the odd issue of Turok: Dinosaur Hunter, I have never really explored the Valiant Universe. Back in the 90s Valiant was the third largest comic book publisher in the world, so why have I only read about one of its fifteen hundred-odd characters? This is a wrong I mean to put right and what better place to start than the offerings generated by last year’s “Summer of Valiant”? 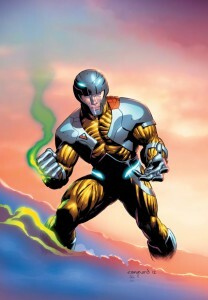 For those of you who, like me, have had their attention caught for too long by Secret Invasions and Infinite Crises, last Summer Valiant Entertainment rebooted their creative universe and released new stories and origins for five of their biggest hitters; Harbinger, Bloodshot, Shadowman, Archer & Armstrong, and X-O Manowar. Like you I’d heard of them, maybe even seen a few copies in my local comic book shop’s back issue boxes, but never really dived in. Well, pass me my goggles, ‘cos I’m about to cannonball this mother. X-O Manowar: By The Sword collects the first four issues of X-O Manowar and tells the story of a young 4th century Visigoth warrior who, while defending his people’s recently acquired Northern Italian real estate from some understandably peeved Romans, is captured by a mysterious alien race known as The Vine. The X-O Manowar in the title refers to a strange religious artifact that grants the wearer all kinds of lovely abilities and firepower, if only the damn thing wouldn’t keep killing everyone that tries to wear it. Suffice to say our young hero, Aric, manages to get his uncivilised hands on the suit through some good old-fashioned rough and tumble and begins his revenge on those that have wronged him. With lasers. For an origin story this was pretty fantastic. It’s hard to be totally original with what is essentially a traditional superhero story, but Robert Venditti keeps things interesting enough with the whole “barbarians vs aliens” vibe which is always fun, along with some nice plot seeds that I’m interested to see grow. Characterisation is a bit on-the-fly, but there’s not much breathing space between swords-in-the-gut and lasers-in-the-face so we get enough fluffy stuff to be rooting for the right guy by the end of a very action-heavy couple of issues. And speaking of action. I have been a massive Cary Nord fan since his artwork on Dark Horse’s Conan series back in 2005 and this man knows his barbarians. The initial battles between the Visigoths and the Romans are a gory treat, full of visceral stabbings and darkly satisfying decapitations and the later, when the action takes on a more sci-fi tone, his rocket blasts and explosions are the absolute business. If you’re looking for something new to cut your teeth on, X-O is only a small part of a much larger universe of characters Valiant have to offer and, with the recent reboot, this is a good opportunity to get in on the ground floor. I left this volume with my interest well and truly piqued and shall definitely be taking a look at what else this re-emerging publisher has to offer. -Sidebar: If you have a QR reader, this volume contains a code you can use to hear X-O Manowar speak. I don’t know if it’s crazy-awesome or just plain crazy-crazy but I am downloading the app as we speak.